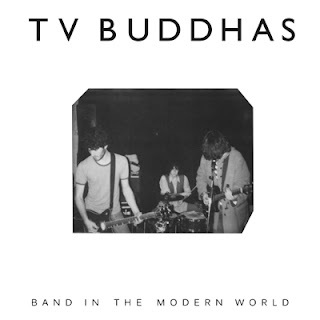 TV Buddhas are an admittedly standard '70s-style punk band out of Tel Aviv; it'd be pointless to name-check for the sake of providing reference points because anyone will gladly compare any current garage/punk band to the Ramones/Hüsker Dü/Stooges standard array. So I'll refrain. Likewise, without knowing what the rock scene is like in Israel, it's also difficult to know what standard is over there. The thing to say, then, is that they're typical of the American garage scenes that are revived every few years and currently held down by, say, Goner or Dirtnap Records, a lo-fi three-piece that pride themselves on their DIY ethic and style, and - dare I say it - have smashing good looks and beautiful hair. They're also based in Berlin at the moment. Just like King Khan. From their blog posts, it sounds that touring finds them exhausted. Or, maybe they want to sound exhausted - so that you, the fans, know how hard they're working to entertain you. Aside from the recordings they've got due in 2012, they also write that they're looking to start "a graphic novel, and hopefuly [sic] a new film." Also, "we started buying some old analog recording equipment, a reel to reel machine, an analog mixer and such, for the purpose of recording our own LP next year by ourselves in our very own Berlin studio." In truth, it sounds like they're making themselves broke and wearing themselves out in order to work hard at fulfilling a DIY image. If I hadn't liked the songs they'd just put out, I'd be inclined to say that they sounded like a parody. But they're not bad, and the Band in the Modern World EP, to be officially released in April, is quite a bit better than the "Hello to Loneliness" seven-inch they released last year. And it was, as they say, "recorded traditionally in one hour." Preview the rest of Band in the Modern World and purchase in April from Trost Records. Great writing. Now, review this!